This estate was originally built in 1989 on nearly a half-acre of land, with a 3 bed/3 bath home. Yes, if this seems familiar, this is the same property that I listed and sold in the past. Since then, it's been entirely renovated and tastefully upgraded. 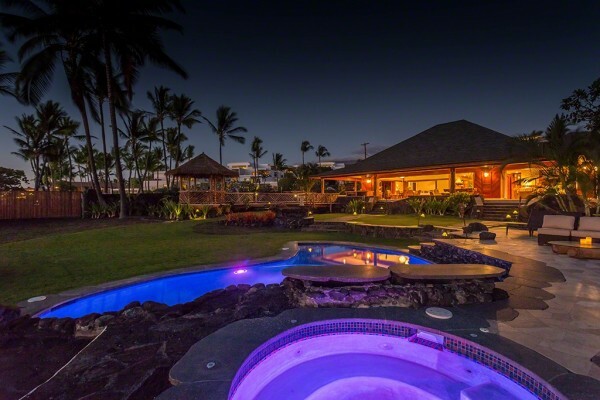 You are secure in this exclusive, gated, peaceful oasis. For your convenience, enjoy your automatic gate leading into your private driveway, and 2-car garage with storage room as well. 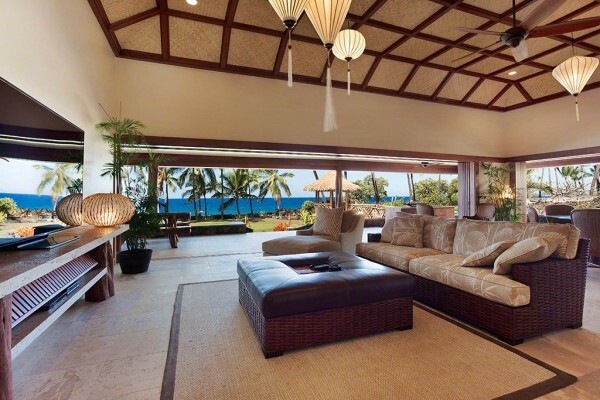 Price: $3,900,000 Living Area: 2,408 sq.ft. Land Area: 21,079 sq.ft. It feels like you have entered into a different era, like you are far away in your own secluded island retreat, but you are conveniently close to town. 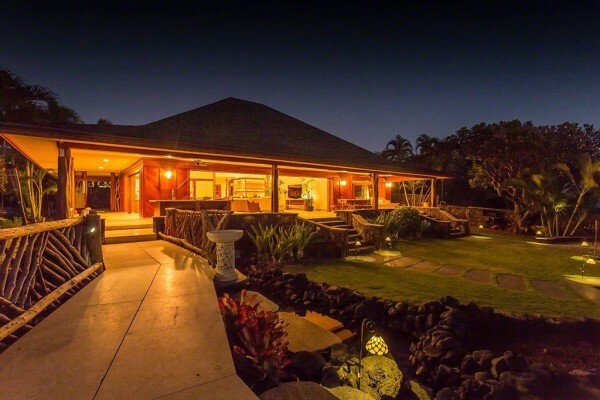 Nestled at the end of Kaiolu Road, you have no neighbors at your elbows, just in the rear of this double wall construction home. 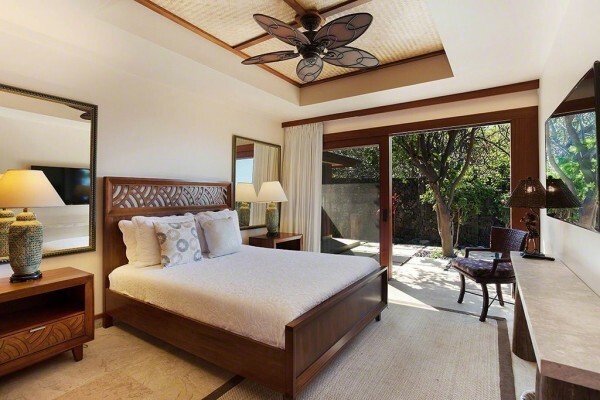 Hawaiian inspired influence has been tastefully sprinkled throughout the architecture and fresh modern updates. Revel in the new and complete renovation of this estate, right down to new walkways and renovated pool. 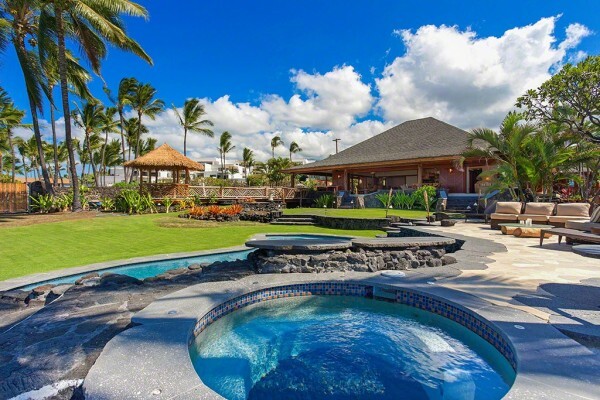 As you walk in through the side door and get a glimpse of the unbelievable setting in the yard - it's OK - stop and breathe in the sweet balmy tropics from this open concept design. 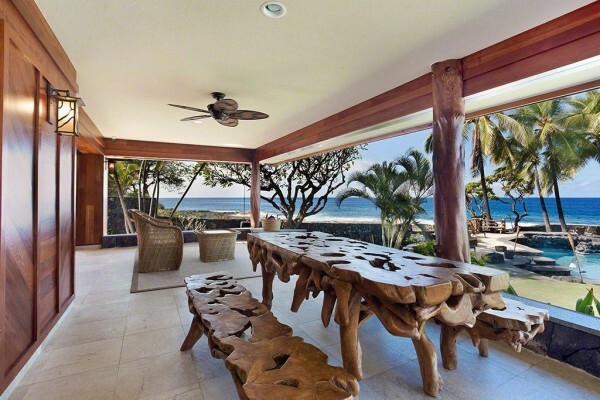 The huge great room, filled with all kinds of picturesque natural light, opens up to wrap-around lanais facing the bluest Kona ocean. 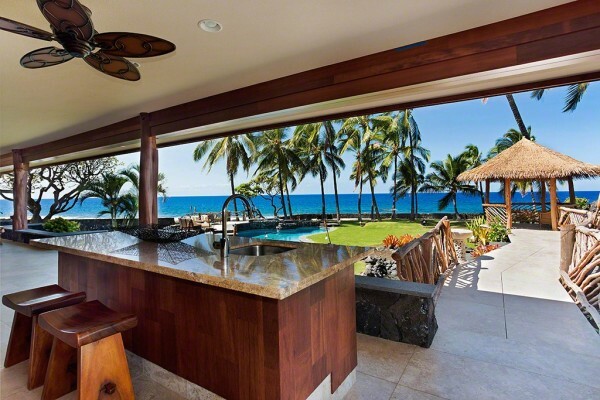 As you're seeing more and more often in Hawaii island designs, the houses are open/unenclosed for easy entertaining or just simply allowing unobstructed views and less walls that leave you feeling separated or closed in. 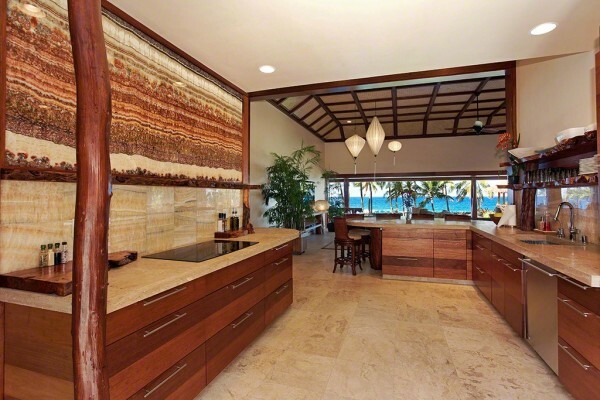 This home has a dreamy, modern, aesthetically pleasing, yet functional kitchen with gorgeous onyx wall and a huge bar top for dining or entertaining. Enjoy preparing meals while still interacting with family and friends. Grab your morning cup of tea or coffee (or sunset beverage of choice) and stroll across your own bridge atop a pond, from your main living area into your gazebo. This is the perfect intimate location for hosting a wedding, gathering, or just plain ol' luxurious living! 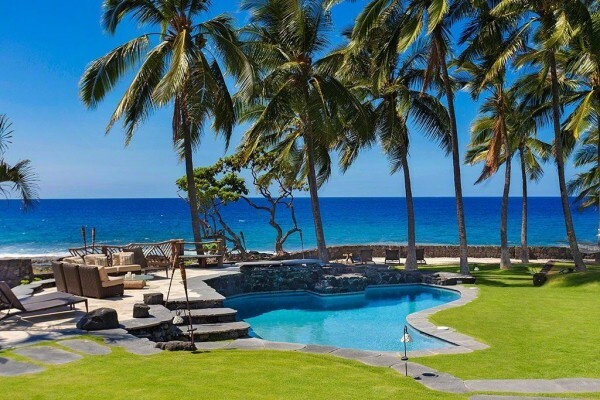 Enjoy the expansive ocean, palm trees, and superb sunset views on your large grassy area, BBQ area, pool, or wind down in your Whirlpool spa. There are plenty of things to do for everyone. Explore off the backyard with easy access to the shoreline area. 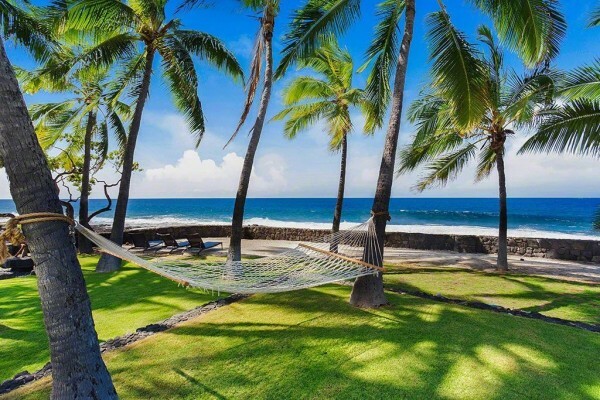 Go on a little excursion, find tide pools in the lava rocks, relax in sandy patches, and be sure to keep your eyes peeled for little sea creatures or Hawaiian seashells. 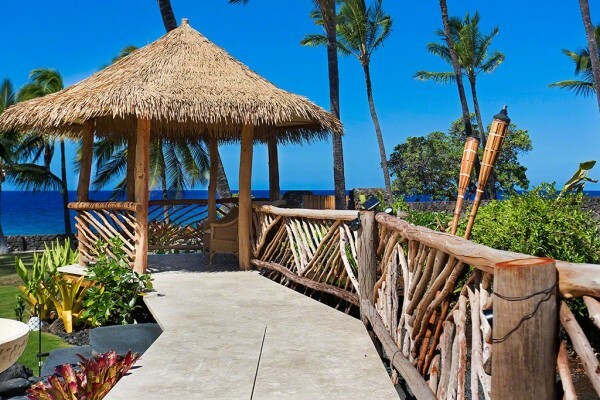 You may also see some of Kona's year-round ocean life, like dolphins, turtles, or whales! 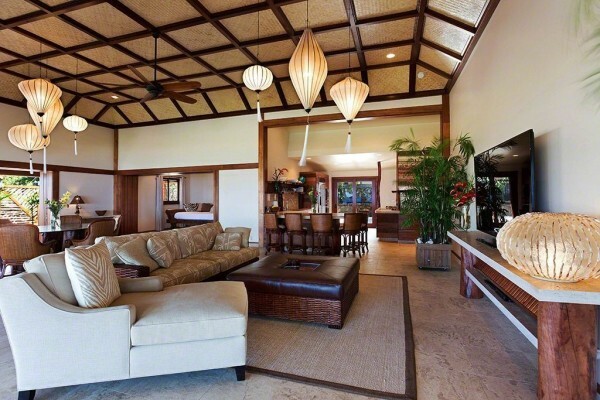 This home is presently a vacation rental, but could be a perminent or second home investment. You also have a separate quarters for guests, caretaker, or in-laws - a 1 bed/1 bath. If you are interested in creating more finishing touches of your own, like expanding your elite tropical Haven, you can purchase the lot to the north of this home, allowing you so many options...from your own premier tennis/sports courts, botanical gardens, or create some sustainable living endeavors. If you can dream it, live it! Start here!